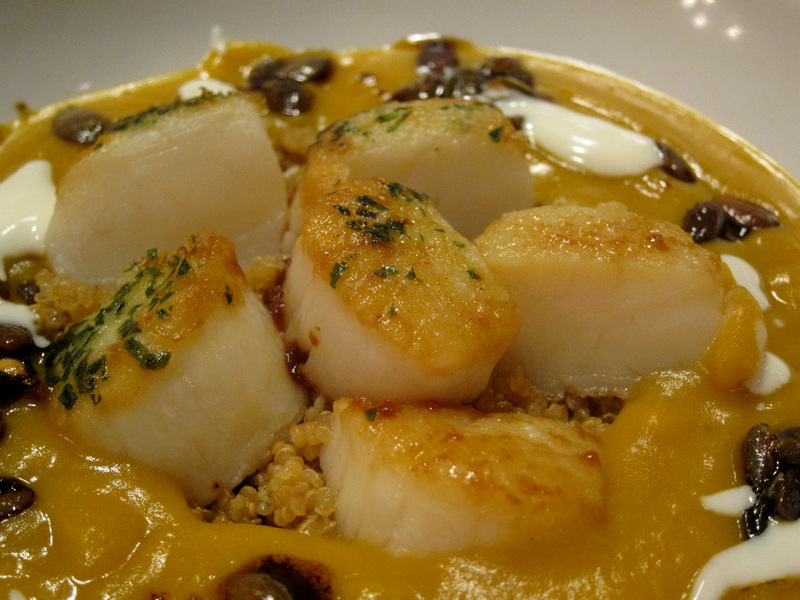 Scallops and sweet winter squash are a perfect combo and this quick dish brings them together in a delicious and beautiful plate of food. It was not a planned fancy dinner or anything. 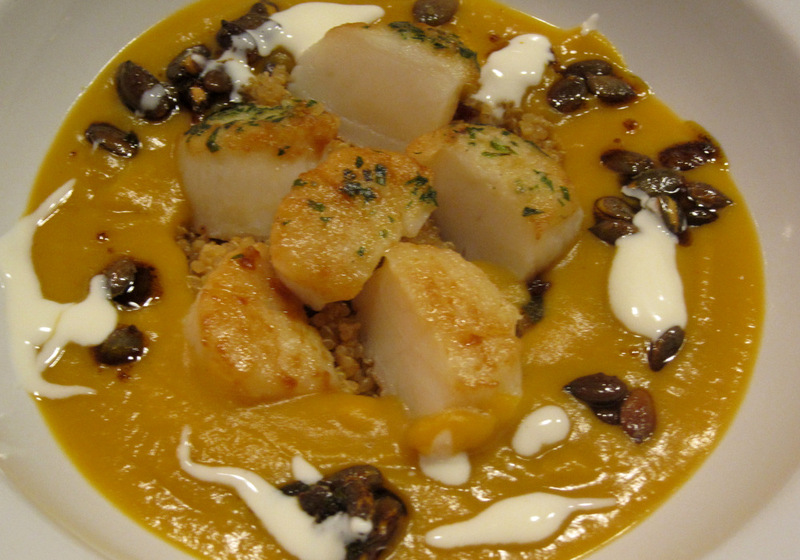 I bought the large scallops because Diana loves them and had the butternut squash on hand at home. 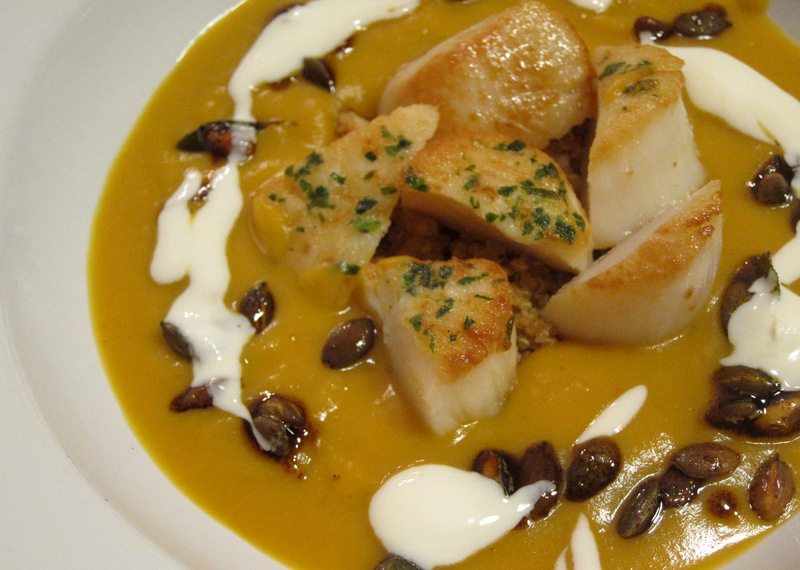 Initially I had thought of just sauteing the pumpkin and serving it with the seared scallops, but then figured that with a little more effort I can make something new, more impressive and at the same time incorporate more flavors and textures. The squash became a loose puree – almost a soup. To make that I baked the halved the squash lengthwise and baked it on an oiled sheet -seeds included- until it is soft. Then I flipped the halves over and baked for an additional 10 minutes or so to get more caramelized flavors and to dry out the squash a bit. The seeds and pulpy bits from the squash get thrown away usually at this point. I decided to toss them in a small pan and gently cook them with butter with the idea to flavor the butter and use later on. To finish the pumpkin soup/puree I sauteed onions and a little chopped golden potatoes in butter and added some stock to the mixture. When the potatoes where sufficiently cooked I put in the squash meat and pureed the mixture. I brine most of the seafood I cook for a several reasons. 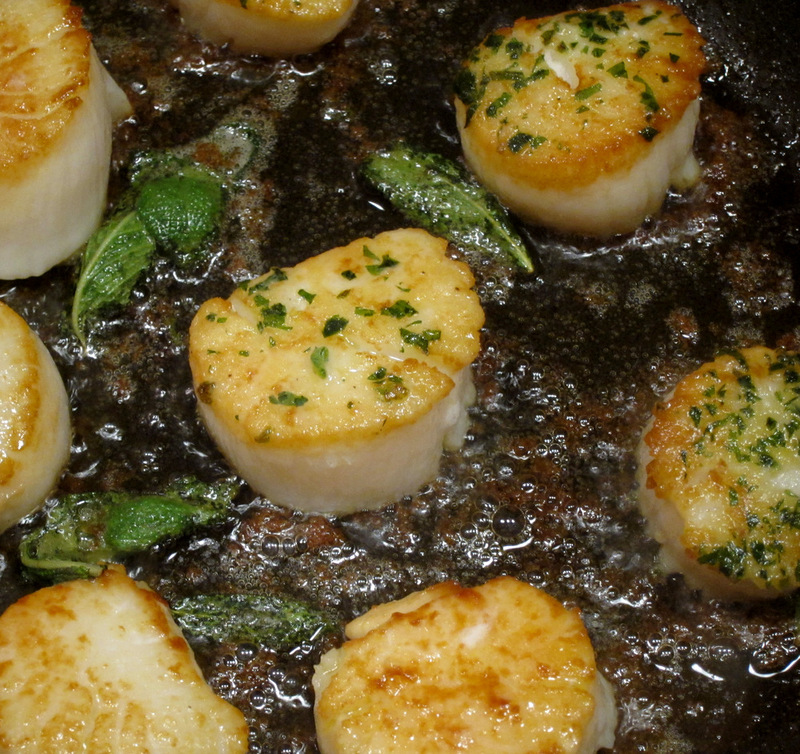 It enhances the texture by firming it up a bit, it also removes any impurities on the surface and helps the seafood get a better color when seared. Last but not least it of course seasons the seafood. I first started doing that after reading about it in Thomas Keller’s Ad Hoc at Home book and getting great results from it. Since then many other sources recommended brining the fish such as the folks from Ideas in Food and ChefSteps. The key here is to make a high salt solution, 10% salt to be exact and to brine the fish or shellfish for no more than 15-30 minutes depending on the size or else you end up with very salty fish. 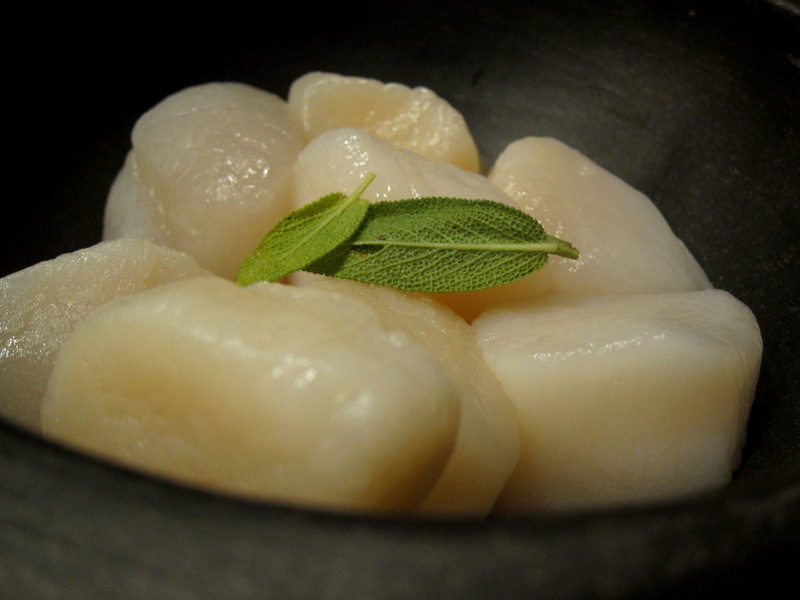 Scallops only get about a 15 minute dunk in there and then they get patted dry really well. To cook the scallops I seared half of them “naked” and the other half got a quick roll in a mixture of Wondra flour and finely chopped parsley. 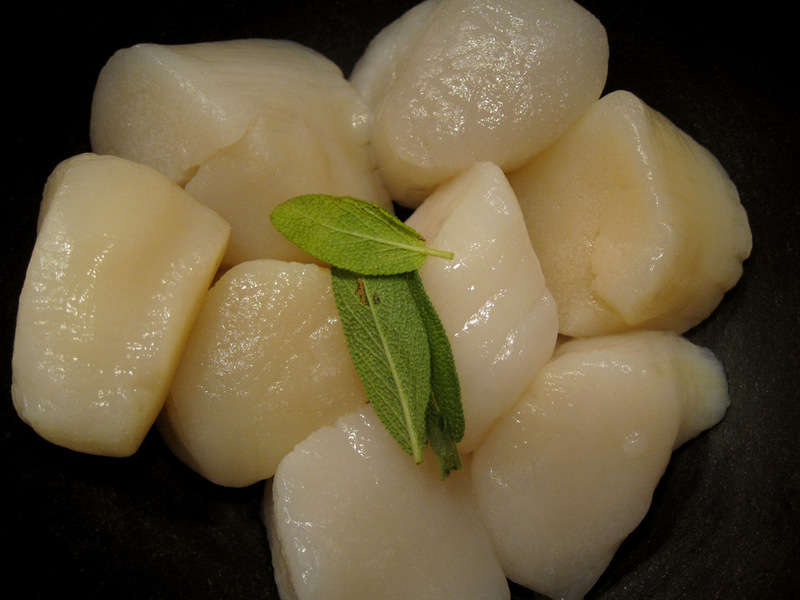 I then sliced the scallops into quarters and plated them up. The quinoa was really a late addition. I wanted to make the dish more substantial since it was our dinner but I did not want something too heavy like pasta, rice or potatoes. Quinoa fit the bill nicely. 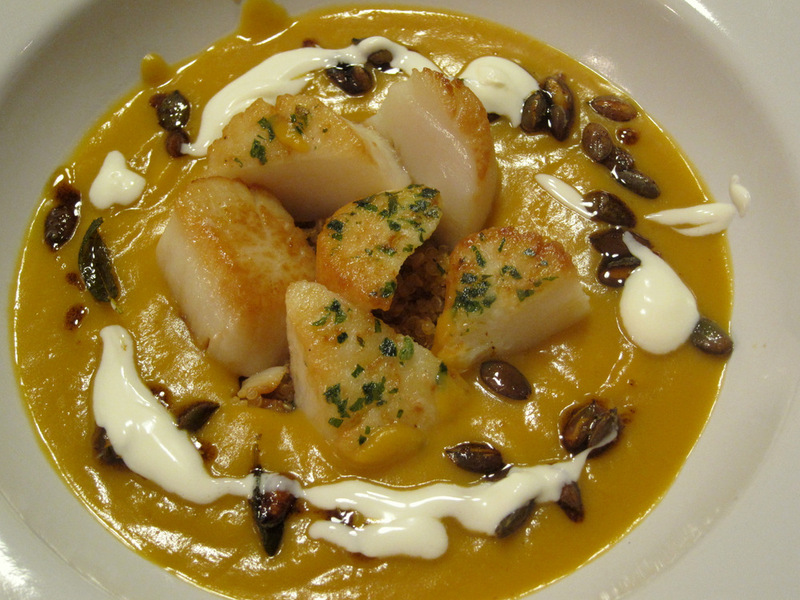 It cooks quick, is light and has a great nutty grassy flavor that paired well with the pumpkin and scallops. That pumpkin butter I prepared using the seeds and pulp of the squash was a great flavor boost for the garnish. I used it to saute some pumpkin seeds and crisp up a few leaves of fresh sage. I tossed these with a touch of salt and pepper and used them as a topping for the finished dish. A final touch of creme fraiche rounded everything out very nicely and gave the plates a welcome touch of clean white streaks.